kids watching television in living room. “It is not right that our children are so widely and easily exposed to adverts promoting foods high in fat, sugar and salt. Small amounts of excess calories every day over a long time causes obesity and all the associated health concerns. We are, however, clear: there is no one solution, so our world-leading plan is about joined-up action across a range of areas so we tackle childhood obesity from every possible angle. “We know that childhood obesity is one of the biggest health problems that our country faces. 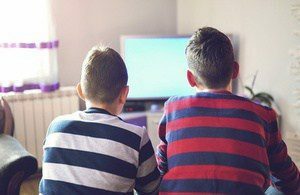 With children spending more time online it’s vital that we look at all options to help us take action and improve the health of the nation – whether through increasing participation in sport, promoting healthy living through our media or through advertising.